Home > News > Contest News > Inviting students, students and the general public Apply to join the drawing contest. Song Contest And the short film contest "Joining together for happiness for the Happy Blue Line Again 2019"
Inviting students, students and the general public Apply to join the drawing contest. 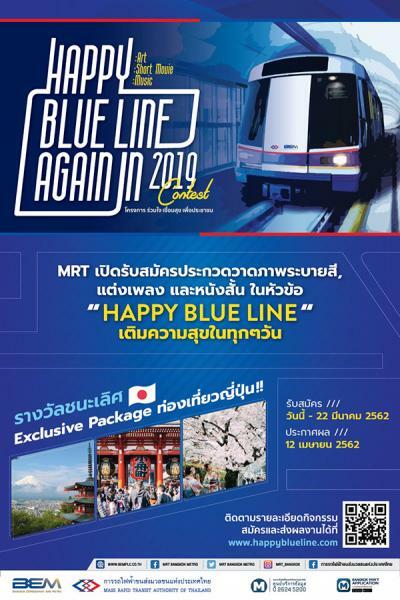 Song Contest And the short film contest "Happy Together for the People, Happy Blue Line Again 2019", awarding air tickets and exclusive accommodation, visiting Japan and other awards Total value over 900,000 baht. Apply from 15 Jan - 22 Mar 62.